3 separate areas of northern Minnesota’s Iron Range receive 5 million dollars for trail expansion!! IROC should be proud….. and kudos To Pete K. and Luther K. along with others for their unending hard work!! My personal (and completely biased) area the “Redhead” trail 25 proposed miles, received $1.77 million. And a bit of a regurgitated article, but it’s Singletracks.com spreading the word!! Almost as fast as the money news broke, the naysayers were, and are still out in force….. “not in my backyard”….. or “what a waste of money! Needless to say, we as a club need to step up our game, and make this endeavor work!! I have no doubt that this group along with the others GRIMBA and Giants Ridge will not have a problem!! Onward to awesome trails to come!! Here’s something I’ve written down and would like to share….. in response to the naysayers….. mainly on the Facebook page “fighting for mining Minnesota.” They had a post up until earlier this a.m. 1/27/18 with 400 plus odd comments, where 90% of said comments were not very well informed/uneducated (on this topic), comments slamming more mountain bike trails!! I doubt any of them will find their way here… but leaving it here just the same…..
As an avid mountain biker, mostly leaning toward the fat and plus bike side of things….. the news about receiving trail money from the IRRRB was welcome news! It’s been a long road to get to this point! Grants have been written, donations have been gained…. plans have been drawn up, thrown away multiple times over a 10 plus years timeframe. Flame on me all you like….. it’s ok!! Before anyone jumps on me about being a liberal, or having liberal leanings…. I lean conservative, I’m a huge Trump supporter and I know mining is the life blood of this region. Because I enjoy a quality adult beverage and pedal a mountain bike DOES NOT change what’s written above. Also, as a life long citizen of the Iron Range, I was expecting and knew the blowback of this news would be fierce, pointed and at some point down right mean and hilarious at the same time!! Oh the outrage….. I get it; everyone is entitled to their opinion…. also as a life long Iron Range resident I know there’s more than enough opinions to fill up all the area mine pits three times over, and then some! To the comments of why can’t “you mountain bikers” use the snowmobile trails to ride on…… 85% of the snowmobile trails are built through swampland…. I don’t think that needs explaining. I’ve also ridden on snowmobile trails during the winter… (bought my trail pass in multiple years) which by the way…. was almost like pulling teeth with the DNR to actually take my money. After many close calls with some (not all) sled heads I stopped riding the trails. Also, why can’t the mountain bikers use the dedicated four wheeler trails? I know I have and still do….. I also have ridden every atv trail there is from Nashwauk to Virginia. I’ve also ridden every rogue atv trail, climb to the top of every iron ore waste pile aka dump within the same area. These proposed trails will be unlike any trails that are currently available to pedal on. Minus Lookout Mtn. Maple Hill and Legion Trails in Rapids. Which were all built by hand and with countless volunteer hours. These new trails will be machine built, by multiple professional trail builders to the tune of 70-100k a mile…. expensive?? That fact is relative….. but build it once and build it right, with sustainability in mind…. through a corridor no more than 6’ – 8’ wide….. which will shrink over time to be about 48” wide, built to shed water naturally and will take minimal maintenance. Maintenance by the way that will be completely volunteer based through each separate club. A huge responsibility as anyone whose ever done trail maintenance surely knows. Allowing atv’s, motorbikes on these trails would, to be honest, wreck the trails beyond our volunteer bases time and expertise…. and quite frankly cost more money to repair. Are we talking multi use with atv’s? Hikers? Motorbikes?Bikers obviously. But who else? Equestrians? See extra maintenance costs here also. And how would we mitigate the speed difference? The safety issues? You have to admit hikers 4 mph tops…. bikers maybe 15-20 mph in short bursts or downhill, or the really “in shape” riders? Compare that to the speed of an atv…. you CAN NOT compare….. human powered to the press of a thumb, or twist of the throttle. See costing more money in trail maintenance here also. The Redhead trail system has been in the works for over 10 plus years, has been moved from sites in Hibbing twice and finally found a home in Chisholm with the Mn Discovery Center. I have no leanings one way or the other about the Mesabi Trail…. I buy my yearly pass, myself and my children ride the trail on a yearly basis. 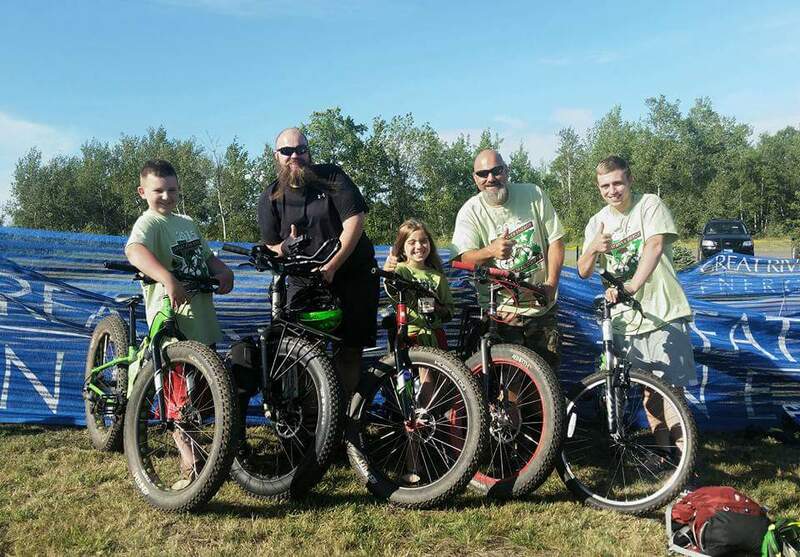 We also ride and pay our fee for the Great River Energy Mesabi Trail Tour…. not cheap for a family. To the point of people saying mountain bikers don’t travel well….. I say hogwash!! Mountain bikers travel very well, and spend money doing it. How do I know this? When we travel to ride different area trails….. we spend lots of money (not in our area) to the tune of $125 – $175 daily, and that’s on the low end; this is not including lodging if we spend the night. I will admit we as a club have our work cut out for us….. as does GRIMBA and Giants Ridge…… also as any club would, who receives this amount of money should have. I believe we are up for the challenge. One good thing in all of this back and forth??? The Crosby/Ironton area went through these same back and forth conversations when they first proposed their trails…….. very good things came from those exchanges…. I have no doubt the same will happen here!! I’ve also read “these trails will dilute the area for riders” I disagree…. there will be groups of riders that will make loops from Duluth, to Cuyuna through these newly proposed trails on a yearly basis…. both in summer and winter…..staying over night wherever they want to end their day. I’ve been active in the mountain bike community for 20 years plus, throughout the state, and know this exact thing will happen. Poo Poo me right now all you like…. we can talk again in 2-5 years. If I turn out to be wrong, I’ll admit it; if you’re wrong, will you?? ← The 2017 Pie Burner Put To Bed….